I woke up this morning to Ina Garten's show, the Barefoot Contessa running on Food network... She was making her chicken piccata with herb roasted onions and mashed Yukon gold buttermilk potatoes for Jeffrey, her husband, who was on his way home from the City. Seems Jeffrey must have roast chicken every Friday evening for supper, otherwise the weekend just doesn't start off right... 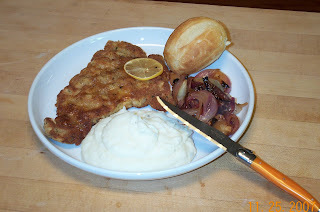 But this Friday would be different because Ina was surprising him with her piccata recipe instead. So if it's good enough for Jeffrey to reconsider his rigid stance on roast chicken, well then it must be good enough! The buttermilk mashed potatoes are worth the extra effort of dragging out my food mill (mine is from Martha's line) and running out for a little buttermilk. I don't care for wine so I left it out of the piccata sauce. Otherwise, this was a great meal. Quick, easy with very little prep required. 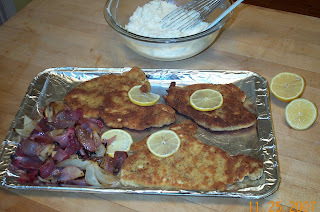 And, yes, it does look like schnitzel, which is why I intend to make this again using veal very soon!